If you haven't heard about Ali Edward's fantastic class called One Little Word - I'm here to tell you its not too late to sign up. This class and the group of women that are in the class are outstanding... there is a closed Facebook Group where we are sharing our journey - and I have already been so inspired! This is the first year that I have signed up for the class but have heard about the concept before - pick one word (or in many cases the word picks you) and explore how that word can shape your life. Sometimes it's an easy word or a hard word - but in either case, exploring how your word impacts your life is what Ali's class is all about. There are monthly topics and "assignments". There is a 6x8 album that Ali uses to document her yearly journey. I will be creating 12x12 digital pages to go into my 2015 album. I am looking forward to seeing the year progress. For this year - I have chosen the word "Finish". This word definitely chose me - it's been screaming at the top of its lungs at me for at least a year, maybe longer! You see I'm a starter - I'm great at it in fact... but I am a terrible finisher!! I even get close often but never far enough...never far enough so that I don't constantly have that little voice at the back of my mind reminding me that X project or Y project just needs a little more of my time to get completed. It's the last bit of journaling for my wedding album, the stack of memorabilia that I keep holding on to to scan, or the almost 25 years of Christmas cards that I am going to do something with one day... The problem with that nagging voice is that it doesn't let the rest of my creative juices flow and it burdens me with guilt. I need to let that all go - I need to wrap up and FINISH those small little things and more importantly I need to be able to say with confidence that maybe some of those unfinished projects really are done and to let that go, too. So join us before February 28th and see where your One Little Word can take you! Congrats on starting the blog. 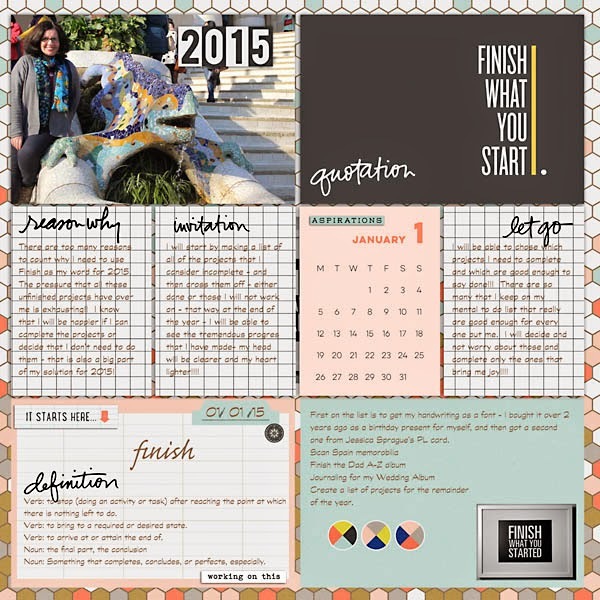 I am sure it will help motivate you and keep you accountable to FINISH all of those projects!! Good luck! Thanks Jaclyn! We are very excited about our new venture!